... a Crazy Cooking Challenge party!. This one is a little different from that last online challenge I was in. Instead of having to make any dish from a blog chosen for me, participants must make a specific type of dish, but from any blog ... except from their own, of course. 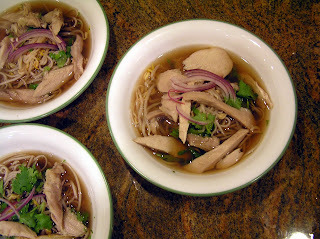 And the Challenge recipe this month is: chicken-noodle soup! Gee, sounds like an easy no-brainer, right? After all, every Sarah, Rebecca, Leah and Rachel has a blog with recipes for Jewish penicillin. And except for quantities and a veggie or spice, every recipe is pretty much the same.